Prevents crows from attacking your crops. Has a limited radius (about 8 "tiles"). A Scarecrow is a craftable item that prevents crows from eating crops. Scarecrows can be crafted at Farming level 1. Scarecrows are not needed to protect crops grown from Wild Seeds, since crows do not attack them. A Scarecrow will protect the surrounding circular area of 248 spaces; 8 spaces each to the north, east, south, and west, as well as 6 spaces each to the northeast, southeast, southwest, and northwest. 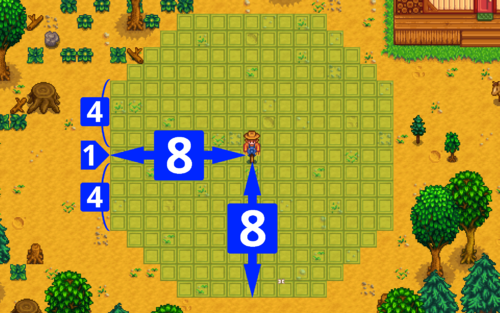 In other words, it protects a 17x17 area, excluding 10 spaces in each corner. Rarecrows work the same way as regular Scarecrows, except for the Alien Scarecrow, which you can place hats on. Purchase at the Stardew Valley Fair for 800. Purchase at the Casino for 10,000. Purchase at the Traveling Cart randomly during fall or winter for 4,000g. Purchase at the Flower Dance for 2,500g. Purchase from the Dwarf for 2,500g. Donate 20 Artifacts to the Museum. Donate 40 items to the Museum. Players are able to place any collected hats on Rarecrow #3 (Alien). This scarecrow, the horse, and the player are the only game objects which hats can be placed on. Rarecrow #1 is reference to the character Turnip Head from Hayao Miyazaki's "Howl's Moving Castle." Interacting with a Scarecrow will display a message indicating how many crows it has scared away. However, the counter resets when moving the Scarecrow.